Plowman's has engineered and manufactured two different belts for the G16 application. 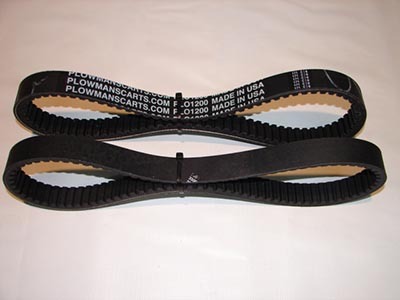 Our stock replacement belt is much stronger than the OEM belt and costs 50% less. Our performance G16 belt length has been adjusted to improve the fit to the clutches and the width has been increased for the ultimate hole shot. Belt construction utilizes Aramid and Kevlar compounds for belt longevity, grip the clutch faces tighter eliminating belt slip, run cooler and are 10 times stronger than OEM.